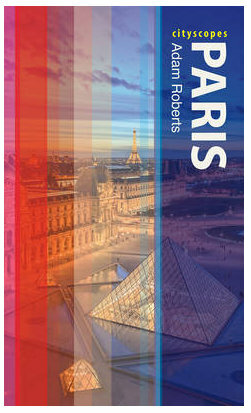 Like many large cities, Paris has its own affectionate nickname. To tourists it is the city of light, but to locals it is known simply as Paname. It is not entirely clear where this name originated from, but it seems that there may be a connection to the city of Panama and its canal, possibly linked to Ferdinand De Lesseps's failed attempt to build the waterway in 1880. A connection was made to Paris, a city cut in half by a river, but the name was probably only adopted because it had such a nice musical ring. Indeed, the continuing popularity of the nickname is probably due to its continual use in song lyrics, such as Edith Piaf's "Marie la Française" featured in the title of this post. Which brings me to the Residence Paname. It is a little surprising to see the nickname used for these large blocks of appartments between Bastille and Republique, but I imagine it seemed entirely appropriate when the construction was on the drawing board. This post is largely an excuse to publish a series of photographs of buildings that I found to be graphically very interesting, but there is also a strange atmosphere to this Residence, a place that imagined itself as a small-scale version of the entire city. The construction almost certainly dates from the 1970s, a period when the city decided to replace run down insalubrious housing with modern multipurpose edifices. 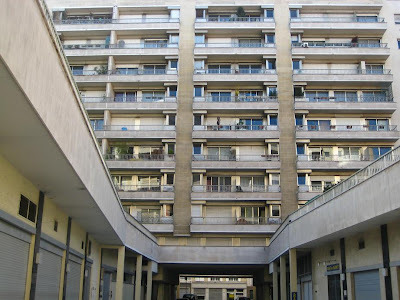 Between the Boulevards Beaumarchais and Richard Lenoir in the 11th arrondissement, a series of constructions replaced industrial passageways and crumbling courtyards, with the Residence Paname being the largest and most interesting. In a similar manner to Le Corbusier's 'Unités d'habitation', this residence combined living areas with spaces dedicated to other purposes including shops and offices. Today the dream of contented communal living seems to be over. The appartment blocks stretch skywards, the inhabitants breathing fresh air from their large balconies and enjoying open views across the city. At ground level, the doors to the shopping galeries are locked. The individual appartment units seem clean and well looked after, but down below, the original concrete design features are damp and crumbing. Residents have also complained of problems with the local homeless population. Whilst they sympathise with their predicament, they are fed up with their stairways being used as beds and the gardens surrounding the residence being used as open toilets. 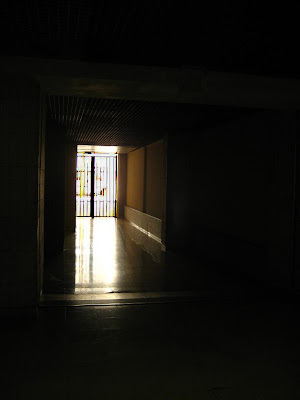 I find an open door into the heart of the construction, an area known as the Centre d'Affairs Paname. Here the units that previously welcomed shops and which were open to the public at large have become individual office units. It is a curious mix of nature and concrete. 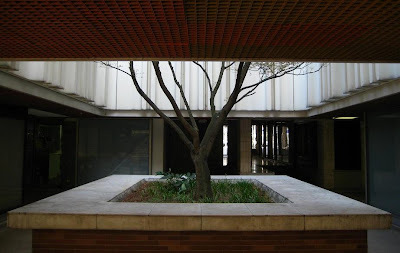 Dark passageways open out onto roofless square plots, where trees reach desperately up away from the gloom. 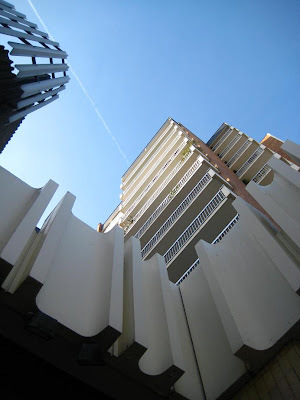 Looking up through these plots gives a glimpse of angular appartments climbing skywards. There is no link today between this top and bottom, between luminous balconies and the opaque alleys leading to locked gates. 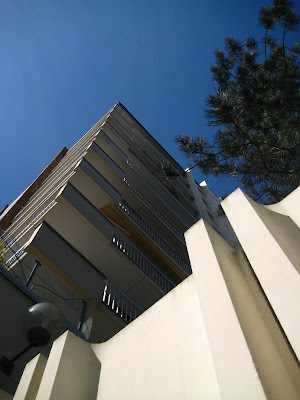 Appartments in this residence are still much in demand as people in cities always want to escape away from the street. Living in the sky, your environment is the patchwork you see stretched out before you. Watching the sunsets beyond the city limits you can almost forget the locked passageways down below and the groups of faceless individuals whose only view is of the stars above. Love the architectural shots, Adam!...makes me almost want to live there, but then again, no, never! I've always wondered about the psychology of living in stacked shoe-boxes and this tower of ants experience, but as you so generously pointed out, if one lives high up enough, the open vista makes up for it, unless it is surrounded by other high-rises!! De très jolies photos sur ce message avec de belles lignes. 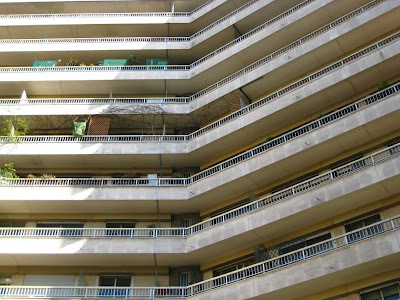 On ne pourrait loger tous les "panamiens" dans des habitations haussmaniennes, soyons réalistes. Toutefois c'est un privilège de pouvoir vivre intra muros. It's curious that the shops are closed. One would think an apartment building would be an excellent site for a restaurant. Ou boulangerie. Ou patisserie. Etc, etc. Je ne sais pourquoi mon ours n'a qu'un oeil libre, Adam. J'espère que tu trouveras ton bonheur dans l'une des deux. I wouldn't be keen to live there, but the photos are amazing. Remarkable photos and story. A very special world you're taking us to! And not what I think of when I think of Paname. The views from up there must be quite striking. I wish we could see them. Perhaps you could try and ring at someone's door one day? Wonderful post! Many cities have tried, with varying degrees of success to create vertical cities. The housing for the Montreal World's Fair comes to mind. The only one that I personally have seen that seems to work is in Helsinki. There they have built a multi-coloured building building that looks like a gigantic set of steps. The roofs of the apartments below form the the terrace of the apartment above. Also built on a hill the views across Helsinki to the sea are extraordinary. Interesting read and some very nice shots. I too am intrigued by the 1970s apartment projects.